Please refer to our stock # BA564 when inquiring. 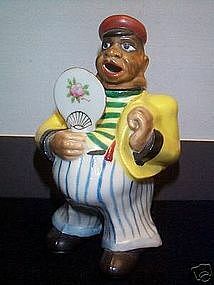 A wonderful and quite rare piece of 1950's Black Memorabilia!! This unique, Japanese made, 6" tall Black Sailor or Pirate ceramic nodder by UCAGCO is in mint condition--no cracks, chips, paint wear or repaint!!! Any white spots, etc in photos are purely the function of poor photography! This interesting fellow wears blue and white striped pants, yellow and green shirt, and yellow jacket. His head nods "yes" and his flowered-painted fan can be made to wave in any direction. Both head & fan have "Pat T.T." impressed on the weighted stem. Truly a rarely found piece of Black Americana with a 2005 book value exceeding $450.00! !